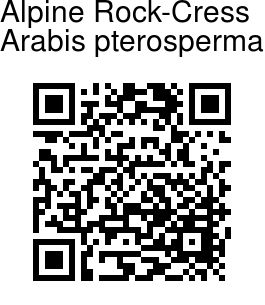 Alpine Rock-Cress is a perennial herb, 20-45 cm tall, erect, simple, rarely branched above, hairy (specially below) with simple and forked hairs. Radical leaves are spoon-shaped or obovate-oblong, 2-4 cm long, 5-15 mm broad, stalked, toothed, tip blunt or rounded, often densely hairy. Stem leaves are oblong, stalkless, 1-2 cm long, 3-8 mm broad, toothed below with tip somewhat elongated and entire, usually slightly eared at base, stem-clasping, sparsely hairy. Flowers are borne in 20-30-flowered, lax racemes, up to 12 cm long in fruit. Flowers are 4-5 mm across, white rarely slightly pinkish. Flower-stalks are 0.8-1.2 cm long in fruit, nearly erect. Sepals are 3-4 mm long. Petals are 5-7 mm long, 1.5-2 mm broad. Stamens are 2.5-3 mm long. seed-pods are oblong-linear, 3.5-6 cm long, 1-1.5 mm broad, compressed, usually erect with suberect stalks, hairless. 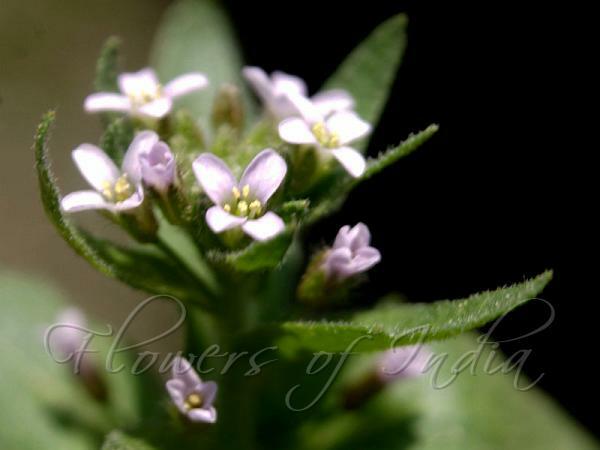 Alpine Rock-Cress is found in the Himalayas, Kashmir to Bhutan, at altitudes of 2700-300 m. Flowering: May-July.